Baden is a camping destination in the Gulf of Morbihan that we really wanted to tell you about. Located between Vannes and Auray, Baden stretches over 2000 hectares along the coast and through the countryside. Here are 3 reasons why you should book your next camping holiday in Baden ! Camping holiday in Baden in the Gulf of Morbihan Sept-Iles beach : wild and wonderful ! If you have booked your holiday in a mobile home, tent, caravan or motorhome in Baden, it won’t take you long to reach one of the most beautiful sandy beaches in the Gulf of Morbihan : Sept-Iles beach is located on a small island of the same name, at Pointe de Locmiquel. Sept-Iles beach can only be reached at low tide across the tombolo (a sandbar which links the island to the mainland). It is nestled in an unspoilt environment, far from civilisation and sheltered from the wind. If you walk around the island, you will come across the most stunning views of Locmariaquer and the entrance to the Gulf of Morbihan in particular. 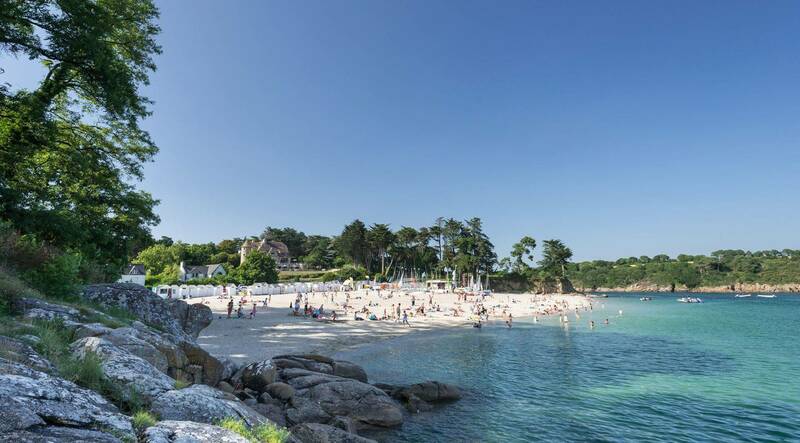 But what campers generally remember is the temperature of the water which is usually a few degrees warmer than on other beaches in southern Brittany ! Just be careful not to be caught out by the currents and check the tide timetable beforehand, otherwise you might have to swim back ! A last piece of advice, don’t confuse the Sept-Iles beach with the Sept-Iles archipelago off the coast of Côtes-dArmor, otherwise your satnav may have you driving right across Brittany, miles from your campsite in Baden! The small museum in Baden ; 4 museums in one ! Fancy visiting something unusual and picturesque ? The Musée des Passion et des Ailes in Baden is a museum unlike any other. It takes you from one universe to another so you certainly won’t be bored ! One room is devoted to Joseph Le Brix, a local child and French aviation pioneer, the first pilot to cross the southern Atlantic without stopping in 1928. Another collection is devoted to clockwork toys, dolls, porcelain and other valuable objects donated by Anne and Jean Farkas. Another area tells the story of Francis Le Pipec, a famous Breton accordionist and displays a collection of old accordions, some of which are very rare. Also displayed are a number of model boats including Christopher Columbus’ flagship, Santa Maria, and the famous Titanic. Ile aux Moines, « pearl of the Gulf », a few minutes by boat ! You can catch a ferry across to Iles aux Moines from Port Blanc (Baden), a lively port all year round but more so in the summer. It’s a short 5 minute crossing to reach the « pearl of the Gulf ». It won’t take you much longer to soak up the gentle, peaceful way of life that’s only found on islands. From the moment you step off the ferry, you will be blown away by the fabulous scenery and views over the Gulf of Morbihan. Set off along the winding pathways and discover a small Breton chapel, a granite calvary, a fountain lost deep in the woods, the ruins of an old mill or a megalithic site dating back to ancient times. The Cromlech de Kergonan, one of the largest in Europe, is comprised of 24 standing stones. Fabulous views guaranteed !